SANTA ANA, CA – On Tuesday, September 25 at 9:00 a.m., the Santa Ana City Council, along with representatives from Santa Ana College, Santa Ana Unified School District, Santa Ana Chamber of Commerce and the League of Women Voters will host a public event to kick off the City’s ‘Register and Vote’ campaign that will run until Election Day on November 6. 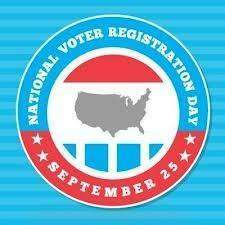 SANTA ANA, CA (October 20, 2014) – The City of Santa Ana along with numerous organizations encourage you to exercise your right to vote. 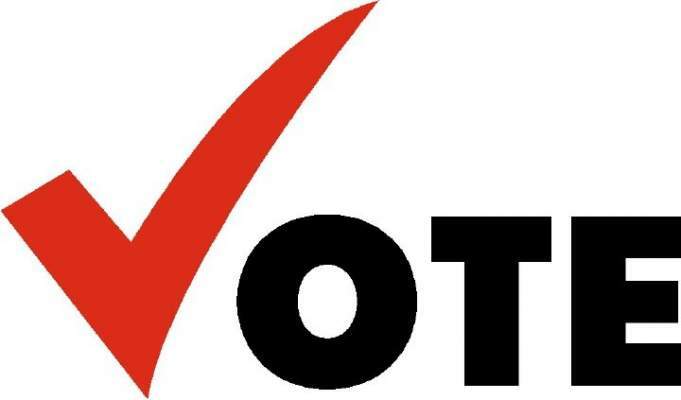 The deadline to register to vote for the November 2014 Election is today – Monday, October 20, 2014. 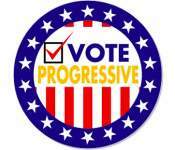 Progressive non-profit organization is looking to hire a motivated and ambitious liberal to manage the day-to-day operations of a door-to-door voter registration program in the Santa Ana area. This is a full-time salaried position scheduled through November 2014. 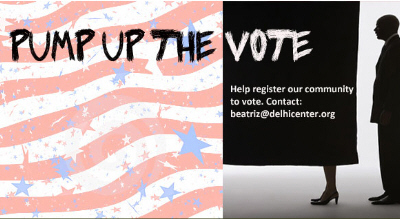 Santa Ana’s Delhi Center is set to “Pump Up the Vote,” on Tuesday, September 25, 2012, at 10:00 am. They will have free breakfast, lunch and dinner between 10 am and 7 pm coupled with their Zumbathon — free Zumba lessons all day! I have received evidence that Al Amezcua, an attorney who is a candidate for Mayor of Santa Ana, did not live in Area 1, when he was serving on the Rancho Santiago Community College District. 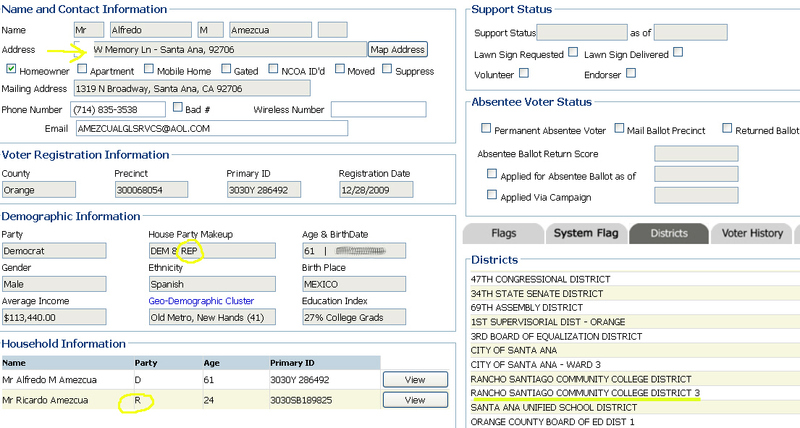 Amezcua registered to vote, at the time, at his office address on Broadway, which is south of 17th, in Santa Ana. That address is in Area 1. However he was living at an address on Memory Lane, in Morrison Park, which is in Area 3, as see in the above graphic. Nativo Lopez, a former SAUSD Trustee who Amezcua helped to recall, is in jail right now for registering to vote at his office in Los Angeles while he was still living, and voting, in Orange County. When Amezcua abruptly quit the RSCCD Board we all wondered why. Now we know. Someone must have found out what he was doing. 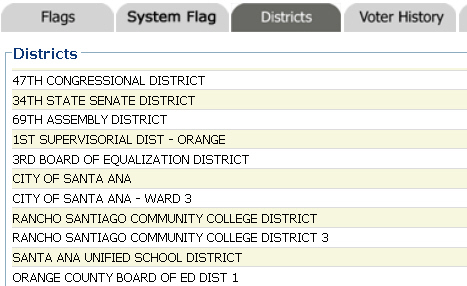 Amezcua is now registered to vote, again, out of his office address, as we disclosed in a previous post this week. And it looks like his son is a registered Republican! How odd. For whatever reason the mainstream media is ignoring this story, even though I emailed it to reporters at the L.A. Times and the O.C. Register. I also sent it to a friend at the O.C. Weekly. No response. I think it was summarily dishonest for Amezcua to play this shell game, and to keep on doing it now. Should he drop out of the mayoral race? I think so. We’ll see where this goes. City Hall insiders tell me that the FPCC and the Secretary of State will be looking into this. Amezcua has not yet pulled his papers although several other candidates have, including Mayor Pulido.